Same active ingredient as Barricade 65 WDG for much less! Prodiamine 65 WDG (WG stands for Wettable Dispersible Granule) is an effective pre-emergent herbicide for pre-emergent grass and broadleaf weed control. Prodiamine is flexible enough that it can be applied in both the spring and fall for season long crabgrass control. Prodiamine 65 WG also control bluegrass, spurge, witchgrass and more, and can be used safely on St. Augustine, Bermudagrass, Fescue and other common turf grasses (see label for complete list). Prodiamine 65 WDG is non-staining and can be mixed and applied along with fertilizer and iron solutions. Bermudagrass, Bahiagrass, Centipedegrass, Kikuyugrass, Seashore Paspalum, St. Augustinegrass, Tall Fescue (including turf-type), Fine Fescue, Zoysiagrass, Buffalograss, Kentucky Bluegrass, Perennial Ryegrass, Creeping Bentgrass (0.5 inches or more in height). I sowed my grass in April of 2012. It was used for crops prior to building a house and seeding. I had the ability to water and thankfully received a good amount from the Big Man. However, I kept noticing that the highest part of my yard, didn't come up as expected. Crabgrass outgrew the centipede so I was left with a major problem. In March of 2013 I applied Prodimine 65 WDG to prevent the crabgrass from coming up. It worked great!!!!!! The spaces where my grass hadn't came up, were now dead and the centipede was able to grow across. My yard is not fully covered, but should be by the end of the growing season. If I hadn't sprayed, the crabgrass would have came up and the centipede wouldn't have been able to spread like it did. I used about 1 pound per acre. In the lower parts of my yard the centipede came up really good last year. As I speak, the crabgrass is starting to come back in the lower part because it is very heavy and fertile soil. You could literally grow anything on it. I wish I would have applied the whole 2 pounds per acre so I would have had a residual of approx. 8 months. Lesson Learned. I highly recommend to anyone who is having a weed problem. I am a happy customer!!!!! Easy to use for First timer! I spray 8 acres every winter using this product. It does an outstanding job as a pre-emergent for crab grass and Kentucky blue grass. I tank mix this product with glyophosphate and trimec, my Bermuda turf look great. This product seems to be doing an excellent job in controlling weed growth in my yard. My Bermuda grass is coming up and so far no sign of weeds. Lawn treatment for Fox tail and crab grass. Used this for the first time spring of 2015. Mixed 4 oz. per 15 gallons in my sprayer. Laid out the yard in 1/4 acre sections using google earth. Have been fighting fox tail for years. After using Prodiamine had no weeds in the treated areas. Didn't do another application in late July like I should have so had some fox tail show up in the fall. In 2016 will do two applications and plan on great results. What is the correct dilution rate for Prodiamine 65 WDG? The first thing you need to know when using an herbicide such as Prodiamine 65 WDG is that the exact amount of water you dilute it with is not important. It is only important to make sure you are using the correct amount of product per 1,000 sq ft of lawn. Use too much and you risk damaging your lawn, use too little and you will not get adequate results. You will need to use 0.185-0.55 oz per 1,000 sq ft . To decide how much water you want to use, you should mark a 1,000 sq ft area, fill your sprayer with water ONLY, and start walking and spraying just as if you were doing the actual application of herbicide. When you are done walking and spraying the 1,000 sq ft area note how much water it took you to spray that area, and that is the amount you will want to mix 0.185-.055 oz of product with for each 1,000 sq ft area that needs to be treated. What are you looking for when applying the diluted granules for spray pattern from the pump sprayer as the liquid leaves the wand? What does the calibration require on round-up-style pump sprayer or similar? Is the calibration in regards to the use of "mist-style" spray pattern or "stream-style" spray pattern? Calinbration does not refer to the spray pattern used to apply herbicides. Although, we would recommend using a mist stream. You would calibrate by determining the volume of water required to treat 1,000 square feet. Use this calibration volume to determine the amount of water and Prodiamine 65 WDG herbicide needed to treat the target area (see the following calibration example). 4. Determine the application rate (fl. oz./1,000 sq. ft.) for Prodiamine 65 WDG from the Recommendations section of this label. 5. To each volume of water used as measured in step 3, add the amount of Prodiamine 65 WDG as determined in step 4. Example: If the sprayer uses 2 gallons of water to cover 1,000 square feet and the desired application rate of Prodiamine 65 WDG is 0.185 - 0.055 oz/1,000 square feet, then you would add 0.185 - 0.055 oz of Prodiamine 65 WDG to every 2 gallons of water to be used." How many teaspoons of Prodiamine 65 WDG per gallon should I use to get a 12 month coverage? The first thing you need to know when using an herbicide such as Prodiamine 65 WDG is that the exact amount of water you dilute it with is not important. It is only important to make sure you are using the correct amount of product per 1,000 sq ft of lawn. Use too much and you risk damaging your lawn, use too little and you will not get adequate results. You will need to use 0.185-0.55 oz (1.1 tsp-3.3 tsp) per 1,000 sq ft . To decide how much water you want to use, you should mark a 1,000 sq ft area, fill your sprayer with water ONLY, and start walking and spraying just as if you were doing the actual application of herbicide. When you are done walking and spraying the 1,000 sq ft area note how much water it took you to spray that area, and that is the amount you will want to mix 0.185-.055 oz (1.1 tsp-3.3 tsp) of product with for each 1,000 sq ft area that needs to be treated. What is the shelf life of Prodiamine 65 WDG? Prodiamine 65 WDG has a shelf life of 3 years fromt he date of purchase. 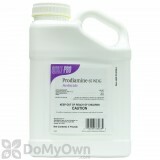 Can you spray Prodiamine 65 with a Gilmour 486 Dial-A-Mix Hose End Sprayer? 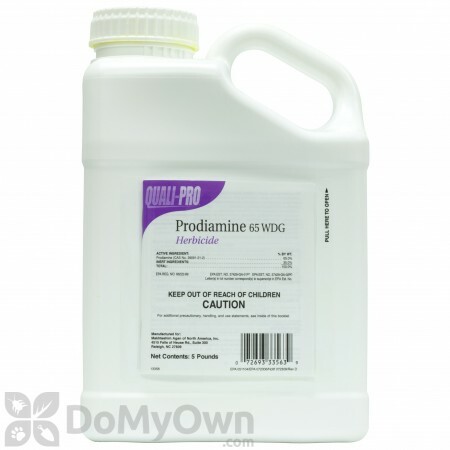 Prodiamine 65 WDG is a water dispersible granule and will not work well in a hose end sprayer. We recommend you use this product in a hand pump sprayer or a back sprayer.